Television shows often introduce certain diseases to ramp up the intensity of the plot line and aside from trauma, heart attacks are perhaps the best way to capture the viewers' attention. There is nothing more dramatic than a character clutching their chest while crumpling to the ground. This gets media ratings but in the real world, a heart attack may be considered a failure of preventive medicine. A person can't do anything about the genes he or she inherited, but the other four risks need lifelong vigilance to avoid not only heart attack but also stroke and peripheral vascular disease. All risk factors involve narrowing of the arteries that supply blood to the body and the consequences that occur when organs don't get enough blood and start to fail. But, back to the heart. It is a muscle like any other and needs blood carrying oxygen and glucose to contract and squeeze and send blood to the rest of the body. When one of the blood vessels to the heart narrows and not enough oxygen gets delivered, that part of the heart gets irritated and begins to ache, no different than arms that get sore from lifting or legs that hurt from running. Heart pain is called angina, and while a person can touch an arm or a leg and feel where it hurts, angina can be trickier. The symptoms may be classic with chest heaviness that radiates down an arm but angina may also produce less typical symptoms like indigestion, backache, fatigue, shortness of breath…or no symptoms at all. Angina is a warning sign that a disaster may be on the horizon. 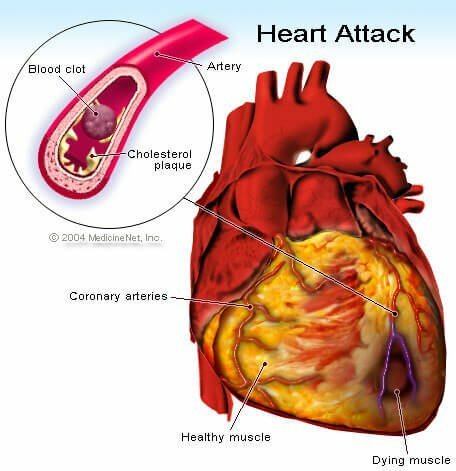 The narrowing of a blood vessel to the heart occurs because of plaque or cholesterol buildup. When the plaque ruptures, it causes a blood clot to form that completely blocks the artery: no blood will flow to parts of the heart muscle, and it begins to die. The clock starts when this occurs, and each minute that passes means that more heart cells die. When a patient gets to the hospital, the goal is to open the blood vessel with an angioplasty within 90 minutes. There are a few obstacles to prompt treatment. The patient has to get to the hospital, the doctors and nurses need to make the diagnosis, and the hospital has to have a cardiologist and team available 24 hours a day and a heart catheterization suite to do the procedure. Many people don't live near the technology but there are alternatives. If there is no cardiac catheterization facility, the blocked heart blood vessel can be opened using thrombolytic (clot busting) drugs like TPA or TNK, but the heart catheterization and angioplasty will still need to be done relatively quickly. It's easier to play prevention than manage disaster, but even when minimizing the risk of a heart attack, the risk still exists and it's important for the patient to recognize that chest pain and shortness of breath are not normal. Women experience a much more difficult task since their pain may be in the back or shoulders or may be more subtle like fatigue, malaise, or indigestion. Watching television is entertainment and people want to watch how a heart attack plays out --with the ambulance rushing to the hospital, the ER, and the operating room. It would be much less exciting to watch a doctor's appointment for a half hour, where there was nothing but talking about risk factors to prevent heart attack The good news is that the audience can actually go to their doctor's office and talk about their health. That would be much better than living the drama of an actual heart attack. Bradley, Elizabeth H., et al. "Achieving rapid door-to-balloon times: how top hospitals improve complex clinical systems." Circulation 113.8 (2006): 1079-1085.